First impression of the nose is yeast. If you have ever stuck your head into a mash tun and inhaled the heady aroma of fermenting wort, you will get the picture. I've never experienced such a malty / yeasty nose in a whisky before, and was expecting a huge ethanol burn, but it didn't come despite the 48% ABV. The arrival on the palate is slow to begin with then BANG! Big delivery of dried fruit followed with what tastes like a handful of Fisherman's friend lozenges, with eucalyptus and liquorice on the aftertaste. Press your tongue tight against the roof of your mouth to get the full benefit of the intense spiciness that lies within. This stuff needs a splash of water and a bit of time to open up. Revisit after ten minutes, and it's a different beast altogether, malty and quite dry. Not too long on the aftertaste and leaves you with a drouth that cries out for a beer to chase it down. I bought a litre of this at the airport two months ago and I'm halfway through. 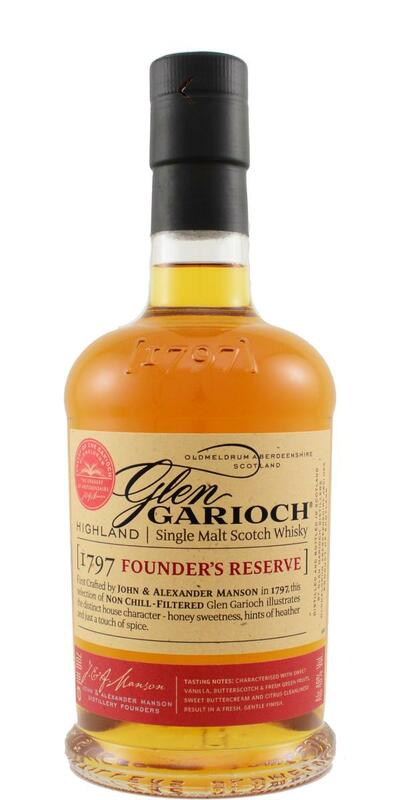 A good value for money dram. Sweet, full, fruity, warm, developed by keeping them in the mouth for longer, pepper at the end, ending spicy, maybe even spicy: Fisherman Friend pastille! The nose is sweet and fruity and a bit mineral. In the mouth then young aromas, slightly bitter, fruit and alcohol. Departure then fruity and then rather tart, a bit metallic. Conclusion: it fits, but the 12 is a different class, I think. He is a bit too young. Sweet honey, malty, dried herbs, some vanilla, spicey at the end, dry, oak. Nice body, Finish is all right. That is some nice malt to start an evening with friends. Nose: quite nice. Honey and scottish butter cakes. Unusually but delicious and interesting. The nose is the blast! Fruity and extremely complex. The taste and the finish are very idiosyncratic but very tasty and interesting. Blind tasting: Subtle wood and fruit notes slowly lift out of the glass. A touch of orange aroma comes out hesitantly, seconds later intense orange aroma suddenly fills the glass and sweet caramel and honey merge into a wonderfully sweet fruit mixture. Burnt almonds and roasted aromas show up before a wonderfully creamy and sweet spice cloud dominates. Some resin and spicy wood give this sample a dark and interesting note. Milk chocolate and a hint of cocoa powder mix with a subtle pinch of cinnamon. The alcohol becomes more intense, but does not bother. Cherry or morello cherries fuse with the fruity orange, the nose is extremely complex and fruity sweet. First fruity elements flash, then spicy wood dominates the first sip. Wood sharpness is created and makes the palate and the tongue to glow. The next sip flows creamy and spicy over the tongue, an indefinable spice note now dominates the taste. A touch of furniture polish or stain .... Dried berries and orange peel, sweet and creamy caramel, soft and mild, strong and spicy, somehow I'm confused. The sharpness is more intense and heats the palate and the tongue properly. Dry and dry, the finish begins. The sharpness slowly fades and spicy wood becomes furniture polish or stain again ... Old walnut aroma develops and an earthy decoilatura slowly ends the finish. Spicy roasted aromas remain on the tongue and leave behind this indefinable spice. Immature apple, light grapes, a little vanilla. Wet light wood, a dash of mint. Sweetish and grassy. Light grapes, some honey. Cornflakes. For me a good drinkable NAS but also no high flyer. Beautiful very round malty nose, at first a light sea air aroma and then fruits come through, in the direction of bitter apple. the 48% are nice, the malty flavors dominate and then they turn into a slightly dry oak. a metallic boy is no longer noticeable to me.